Please choose your suit size only for Best Fit. When you wear your suits, you don't walk out side without a navy wool overcoat when it's cold out. You have to do it right and stay warm and nothing does that better than a wool overcoat. Besides, it shows people that you really know how to wear a suit no matter what the weather. 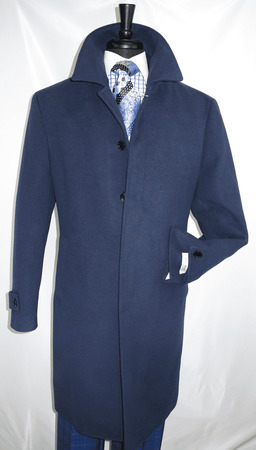 This navy wool overcoat features an easy to wear classic style that looks great. It features a classic regular fit with a center vent in the back with a covered front button style that just works. Made wool blend fabric.